The Ducati Scrambler is certainly the talk of the internet right now, no surprise there since Ducati just hosted its international press launch and the bike reviews are starting to roll out from various publications. You can read ours, right here. All this press, aided by Ducati’s extensive marketing rollout ahead of the launch, has caused the Scrambler to catch the imaginations of many riders. This is of course to design, as Ducati would love to see the Scrambler become a favorite platform for modders and customizers. 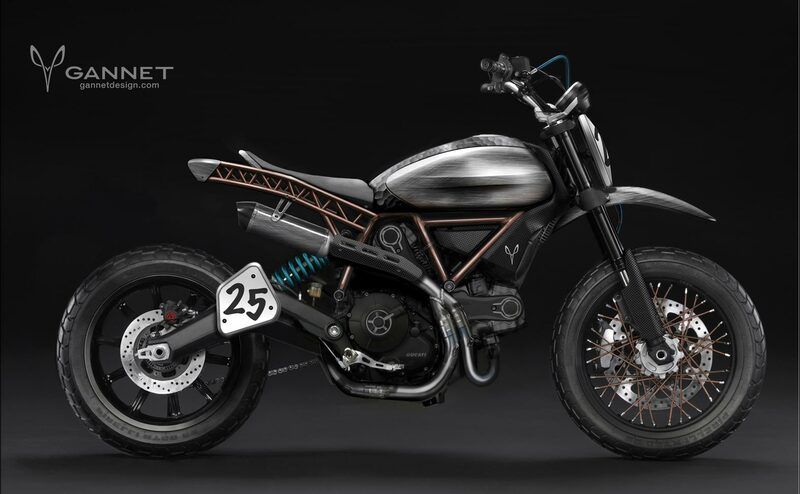 The Ducati Scrambler also caught the eye of concept artist Gannet Design, whose work we have shown on a number of occasions. The concepts are interesting, and true to the scrambler notion of riding. We particularly like the colored-spoked wheels, though the mismatched rear wheel setup doesn’t catch our eye too well. The trellis rear subframe looks a little forced to our eyes as well, paying perhaps too much homage to Ducati’s sacred cows and design language. Still, the designs are interesting, and we are sure they will serve as fuel for the wonderment of some lucky Ducati Scrambler owners.